Fairfax County Executive Ed Long presented a proposed $3.99 billion budget Tuesday to the county Board of Supervisors that includes a real estate tax increase of 4 cents (to $1.13) for every $100 of value for Fairfax County homeowners. That will represent a tax bill increase of about $303 for the average county homeowner, Long said. And while that increase will provide an additional $23.31 million to the county’s coffers, the county is still offering far less than the 6.7-percent increase Fairfax County Public Schools requested for Fiscal Year 2017. Long, who said Fairfax is still suffering from a sluggish economy and slow growth in the real estate market, also said the county will start off FY 2018 with a $74 million deficit. See an executive summary of the 2017 budget — including other county spending and savings — on Fairfax County’s website. Long is proposing the county transfer a total of $2.08 billion to the schools. That number is a 3-percent increase from Fiscal Year 2016. Included in that number is a school operating transfer of $1.88 billion (a 3 percent, or $54.75 million, increase from 2016). The county is also offering $13.1 million in construction support and a school debt service transfer of $189.87 million. Earlier this month, the Fairfax County School Board requested an FY 2017 operating transfer of $1.95 billion — a $122.7 million increase (6.7 percent) over the FY 2016 General Fund transfer. “It should be noted that the 3-percent transfer included in the Advertised Budget is more than the 2.3-percent revenue growth rate without the tax rate increase,” Long noted in his presentation to the supervisors. 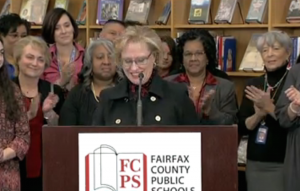 The largest share of Fairfax County dollars go towards funding schools. Last year’s transfer was also more than $2 billion. Long reiterated that the commonwealth has for years is not meeting its share of funding for education in Fairfax County. Since FY 2009, the State has reduced its share of funding for public education by more than $1 billion annually, he noted. “Virginia is in the top 10 in both per capita and median household income but in the bottom 10 for public education funding Fairfax County Public Schools,” he said. In January, FCPS Superintendent Karen Garza proposed a $2.7 billion schools budget that offered raises for staff, a commitment to keeping elementary school classes below 30 students, and kept all programs intact. Garza — as well as a school system Budget Task Force — had been warning for the latter half of 2015 that everything from music and sports programs to Advanced Academic Centers and Foreign Language Immersion programs could be on the chopping block. But no cuts for FCPS in FY 2017 relies on the larger contribution from the county. Over the next six weeks, the two sides will attempt to compromise. “This news means that, unless the Board of Supervisors provides for a funding increase above Mr. Long’s recommendation, Fairfax County Public Schools will once again have to make damaging budget cuts that will reduce educational opportunities for our children,” Hynes said. Lee District Supervisor Jeff McKay pointed out that the county has increased its transfer to the schools every year for eight years. Hunter Mill Supervisor Cathy Hudgins said it is of utmost importance for the county to have a strong school system. Hudgins, as well as Long, will discuss the county budget and take questions at the Hunter Mill Community Summit, 9 a.m. Saturday at the Vienna Fire Station (120 Center St. South, Vienna). On March 1, the Board of Supervisors will advertise the 2017 tax rate. There will be public hearings on the budget April 5 -7. The budget markup will be April 19, and the board will adopt its final budget April 26. The school board will adopt its final budget in May. Photo: FCPS Superintendent Karen Garza at January announcement of a schools budget with no cuts. That budget depends on a a 6.7-percent transfer from the Fairfax County.